Most of the treks in the Everest region might need you to undertake a healthy level of preparation. It also consumes a bit of time as it takes close to two weeks to complete a lot of these treks. But the Everest view Trek is a short trek that gives you wonderful views of the mountains in the Everest region. You also don’t have to prepare immensely for this trek. In the Everest view trek, you trek in the Everest region for only about a week. The trek takes place in altitudes in places which are in altitudes that are lower than 4000 meters. You also spend time acclimatization. These factors make you less prone to altitude sickness in this trek. 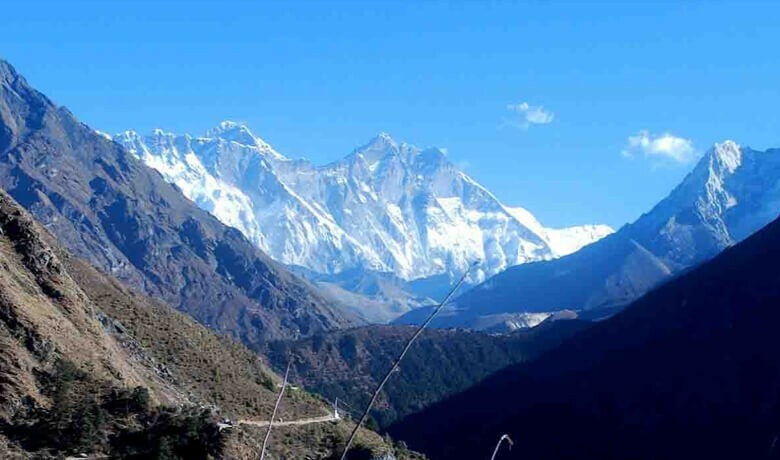 During the Everest view trek, you will visit some classic places in the Everest region. The first of them is the visit to Luka Airport. With its short airstrip and thrilling location at the top of a hill, it is bound to make you feel delighted with adventure. You will also go to Namche Bazaar. You spend time acclimatizing and strolling around the markets, restaurants, pubs, and other facilities of Namche. You will also head out from Namche to Hotel Everest View. From the Hotel Everest view, you will get some fantastic views of the Himalayas of the Everest region. Due to this region, Everest view trek is sometimes also called Hotel Everest View Trek. The highest point along your destination is Tengboche Monastery, which is located at an altitude of 3867 meters. This monastery is a perfect representation of the Tibetan Buddhism of this region. This monastery id draped by the panoramic views of mountains like Everest, Lhotse, Ama Dablam, Thamserku, and Tawache. If you are a beginner who has not trekked in high altitude but don’t want to miss the glorious mountains of the Everest region, this is the perfect trek for you. With gentle hikes in the lower altitudes, this trek can be completed by people of all age groups and different trekking experiences. Lukla is a dream of an airport for all thrill seekers. The airport is located at an altitude of 2800 meters. The flight to Lukla from Kathmandu is 35 minutes long. It gives you wonderful views of the mountains of the Everest. The wonderful town of Namche Bazaar is one of the most sophisticated areas in the Everest region. The town has excellent facilities for restaurants, pubs, hotels, cyber cafes, and shopping. Namche is also home to Hotel Everest View, which once held the Guinness Book of World Record for being at the highest altitude. A visit to this hotel is bound to leave you amazed with a beautiful view of the Himalayas of the Everest region. Close to Namche also lies Syangboche Airport. The airport is an unofficial one. The surrounding views from this airport are also wonderful. 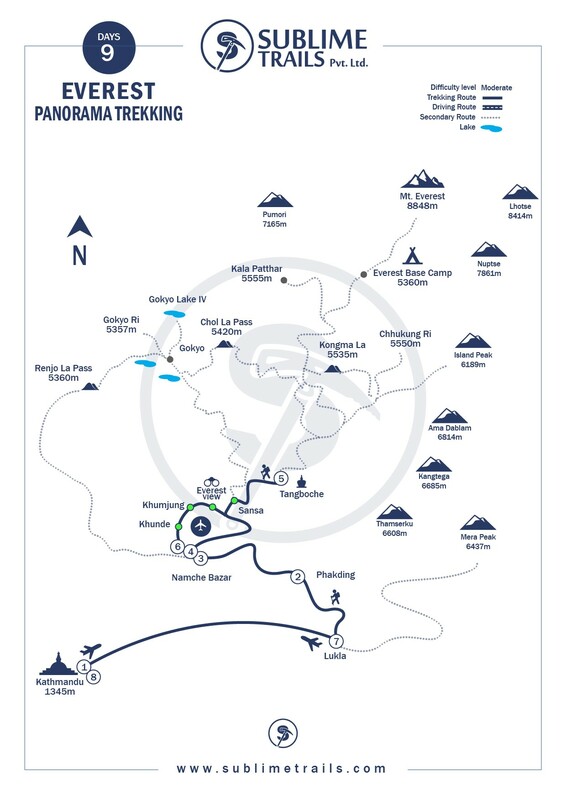 Most of this trek takes place inside the premises of Sagarmatha National Park. The trek in the Everest region is only about a week long amidst the alpine forests of the national park. Beautiful forests of fir, birch, and rhododendron are sure to delight you. Further, the trek is a light as you don’t cross even 4000-meter mark. This makes you less prone to altitude sickness. You also won’t have to deal with the cold in the mountainous region of the higher altitudes in the Everest region. Tengboche monastery of the Everest region was established in 1916. It is the largest monastery of this region. It is an embodiment of the Tibetan Buddhism of this region. The monastery lies within the premises of the Sagarmatha National Park. One of the best attractions of this monastery is its wonderful mountainous background. Panoramic views of the mountains of the Everest region that surround this monastery is bound to take your breath away. The representatives from our office will be at the Tribhuvan International Airport with our vehicle to receive you. They will have a signboard that reads “Sublime Trails”. That will make it easy for you to locate them. You will be then head out to your respective hotel in the vehicle. This will be your first night in the capital city of Nepal. The city is full of temples. You can stroll around small towns in this city if you have time and energy during the evening. You will have breakfast in the morning and head out to Tribhuvan International Airport. You will then take a 35-minute flight from Kathmandu to Lukla. Upon arrival at the airport, your guide will brief you and introduce our porters to you. Then, you will begin your hike towards Phakding. Firstly, the trail descends towards the Dudh Koshi River. After a while, you will join the main trail to Namche Bazaar located just above Chaurikharka at (2713m). You will then pass through the small village of Ghat (2550m). From Ghat, it is a short walk to the mountain village of Phakding. You will stay overnight at a Guesthouse with Basic accommodation. You will spend this day acclimatizing in Namche Bazaar. Acclimatization helps your body adjust to the low levels of oxygen in higher altitudes. As Namche lies at an altitude over 3000 meters, it is extremely important that you spend this day strolling around Namche. This helps your body get used to the thin atmosphere here. For acclimatizing, you will hike up the Syangboche Airport. From there you will go to the Everest View Hotel. From these places, you can get rewarding views of the Himalayas with stunning sunrise and sunset over the panorama of Khumbu peaks. Your trek carries along the rushing glacial waters of the Dudh Koshi river. The start of the trek is mainly flat. You will also get to view mountains like Mt. Everest, Nuptse, Lhotse, Ama Dablam, and Thamserku. Your trek carries along the rushing glacial waters of the Dudh Koshi river. You will also encounter a suspension bridge over Dudh Koshi river along the way. After you cross the suspension bridge, the trail becomes quite steep. Carrying along the trail will lead you to Tengboche. Tengboche has one of the oldest monasteries in this region called Tengboche Monastery. The monastery dates back more than one century. Inside the monastery are amazing ornate wall hangings, a 20-foot sculpture of Buddha, and the musical instruments and robes of the Lamas. your group will be taken to observe a prayer ceremony either in the evening or morning depending on how the day's trekking has been. Mani Rimdu is a colorful festival that is celebrated in this monastery in the month of October/ November. During this time, the monastery buzzes with many devotees and ceremonies that take place. Tengboche is the highest point along the trek. From Tengboche, you will descend to Namche Bazaar the next day. You can enjoy the mountains like Everest, Lhotse, Tawache, Nuptse, Ama Dablam etc. before you descend back to Namche. The trail to Namche Bazaar descends to Dudh Koshi river. You will also cross the suspension bridge you came from the previous day. The trail will continue to Namche Bazaar, where you will spend your night. Our airport representative will drop you at the Tribhuvan International Airport for your departure from Nepal. It was a pleasure serving you at SUBLIME TRAILS. We hope the relationship developed between us will extend to further visits to this amazing country of Nepal in the years ahead. We would like to wish you all the best & a safe journey home. Lodging in Kathmandu in a 3-star hotel for 2 nights with BB plan. We went on a day tour with a guide from Sublime and it was a great day! The guide had a way to make each point interesting and relatable. I actually retained information from this tour instead of just having old buildings pointed out. Highly recommended!